Every day we may have to delete some useless files from our computer to save some space, and then we empty the recycle bin. But sometimes, we always accidentally delete something that we still need. The deleted files are stored in recycle bin. But if you empty the recycle bin, the lost files cannot be recovered anymore by hands. But there is chance to recover erased files with recovery software. The problem is how to find the best recovery tool. There is a recovery tool you can use—WiseRecovery. WiseRecovery is the best recovery software that can help you recover erased photos, video files, music, emails and other multimedia files from your computer hard drive, SD card and other storage media. It works very efficiently and can do a good job in recovering lost files of all kinds. After recovery, WiseRecovery will take you to the destination folder where the recovered files are stored. WiseRecovery has a simple working system. You don’t need to be a professor of computer, and just in a few minutes you will get the erased files back. 1. WiseRecovery supports all common file formats, including Image, Video, Music, Document, Emails and Archives. You can recover every kind of files due to any reason. 2. 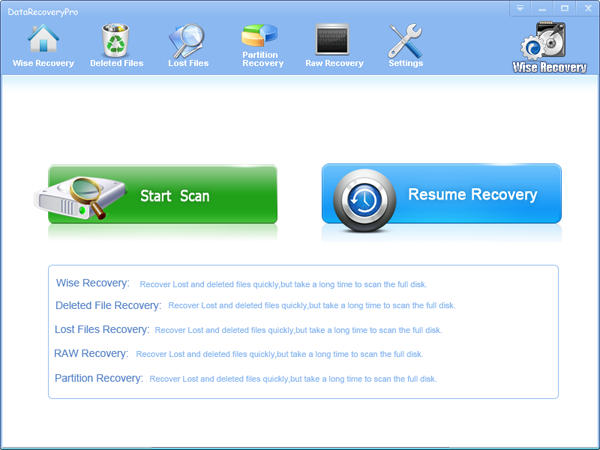 WiseRecovery supports all situations of file lost, such as accident deletion, formatting, device corruption, etc. 3. Support all digital devices, such as hard disk, SD card, memory stick, raid, and other multimedia device. 4. Support all file systems, FAT, Windows exFAT, Linux, RAID. 5. WiseRecovery can fix all the error messages given by all the digital devices. A. Run WiseRecovery software, and click on Start scan. B. Choose the drive to start scanning. C. Now, the scanning process will commence. After scanning, list of file types will be displayed in the left pane. D. Click each file type to view files in it. You will see thumbnails when you click on the file type. E. You can either recover all or selected files by clicking the Recovery button.